Immersive theatre experiences can be extremely variable in content, style and quality but they all rely on an audience that is willing in interact in one way or another and make the most of their time. 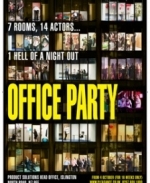 Office Party, taking place in and around the Pleasance theatre in North London, is no exception with its hosting of Product Solutions’ Christmas party to which we are all invited as employees of this organisation. And basically you get back what you put in: it is the kind of experience that rewards full-blooded participation – if you stay on the sidelines, then you honestly won’t have half as much fun than if you throw yourself right into the middle of things. Upon arrival, one is allocated into a staff team: executives, creatives, domestic services amongst others and then ushered into a bar. From there, the staff teams peeled off into their respective groupings in various rooms around the complex to get the party started. After a bit of team bonding, you then enter the party proper in the main hall where a disco has been set up, stages at either end for the entertainment and, you’ve guessed it, another bar and then the party starts. There are party games where teams compete against each other to pass balloons and eat cream doughnuts without hands, there’s some fun entertainment from the heads of departments which spills out into little mini dramas which reverberate throughout the evening and also cabaret turns from the likes of show creators Ursula Martinez and Christopher Green amongst others. Those looking for finely nuanced character work and over-arching plot arcs will be disappointed and indeed if you’re not willing to get involved with the show, then it may even be a dull experience as there are moments where nothing is ‘happening’ per se. But the main part of the fun for me was in these bits inbetween: having adopted the character of an employee of this organisation, taking the chance to mingle with other departments and engaging with others just as up for it as we were, having a good old moan about our bosses and thus creating our own experience to complement the nearly note-perfect replication of the office party that is put on for us. It helped that I ended up in Domestic Services, the least well-regarded of the departments even by the CEO of Product Solutions, and so it was so easy to fall into character as a group of put-upon cleaners and deliciously good fun to go into the party with a collective chip on the shoulder. Massive, massive credit goes to Janice Connolly as our Head of Department Kath, who was exceptionally good at bringing us together as a team in mere minutes, throwing out joke after joke and generally being adorable – we’d’ve happily partied with her all night long! We proved our worth by winning two of the party games outright – our prizes were a bottle of vodka to share, and then half-price drinks for our team for a short period of time – and we had the hottest model in the final one (well done Lloyd!) thought events overtook us… And I had a great time bantering with the CEO, facing off with a mouthy guy from Accounts in the smoking area and being threatened with a disciplinary by the Head of HR (the gorgeous Holly Burns) and dancing flirtily with one of the few executives who let their hair down by the end of the night. It was amazing to see how much of an influence our labels had on us: most of us in DS had pledged to join a union by the end and heckled the CEO’s speech accordingly; the Accounts team played up to their stereotyped role with huge amounts of fun; and the executives got their own private drinking area and surprisingly quite a few remained up there, aloof from proceedings and I can’t imagine they had anywhere near as much of a good time at such a remove. There’s no doubting that the booze fumes had their own part to play in our particular enjoyment especially as the night reached its end, but I would wager that as much fun could be had regardless of how many shots you choose take or not. This comes as a highly recommended show from me, and from my companions for the evening, we all had an absolute ball in this immersive delight of an experience. The biggest danger to your enjoyment will be your own passivity, so cast off any inhibitions and immerse yourself fully: remember, what happens at the office party, stays at Office Party! I was brave enough to go on my own. I too ended up in Domestics and had an unbelievably good time. Quickly warming up to my fellow 'colleagues'. I hope to return with friends although that might just inhibit me!